The case is officially closed on what's being called the oldest forensic investigation in history. 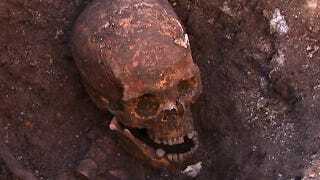 A new genetic analysis is providing incontrovertible evidence that the skeleton found under a parking lot in Leicester belonged to the king, while uncovering new truths about his appearance and lineage. Richard III was the last king of England to die in battle. His remains were discovered in 2012 under a parking lot by archaeologists from the University of Leicester. Early last year, scientists used a DNA analysis to link a Canadian family to the remains, offering compelling evidence that it remains belonged to the king. But the new analysis by an international research team led by Turi King considered a deeper pool of evidence. Was King Richard III&apos;s long lost body just discovered beneath a U.K. parking lot? The researchers collected DNA from living relatives of Richard III and analyzed several genetic markers, including the complete mitochondrial genomes (which are inherited through the maternal line), and Y-chromosomal markers (which are inherited from the paternal line), from both the skeletal remains and the living relatives. The researchers also carried a statistical analysis, which hadn't been done before. Even at their most conservative, the researchers say the remains have been confirmed to 99.999% accuracy. Analysis of the mitochondrial DNA shows a match between RIII and his contemporary female-line relatives, Michael Ibsen and Wendy Duldig. The Y-chromosomal markers differ, which is not surprising. The chances for a false-paternity event is fairly high after so many generations. Richard III's male line appears to be broken at one or more points between himself and living male-line relatives descended from Henry Somerset, the 5th Duke of Beaufort. Remarkably, the new analysis also sheds some light on RIII's appearance. Genetic markers suggest that he probably had blond hair and that he most definitely had blue eyes. Hair and eye color prediction from genetic data. Thus, his depiction in the portrait that resides in the Society of Antiquaries in London is the most accurate we have of him. Leicester University has put together a wonderful video package where they explain their methodologies and findings in great detail. Read the entire study at Nature Communications: "Identification of the remains of King Richard III." Follow George on Twitter and friend him on Facebook.